My 2011 GrowVeg article on the basics of growing horseradish has accumulated over 80 comments, including some excellent questions about this big-flavor plant. I also learn more about growing horseradish with each passing horseradish season, which begins and ends in the cold days of winter. It’s time for an update on growing horseradish and the delicious warming condiments you can make from the nutritious roots. Growing horseradish is a worthwhile endeavor, because in addition to its culinary uses, horseradish is a potent medicinal herb. Recent research has validated the long-held belief that horseradish has potent antibacterial properties, while other research has shown that horseradish can be effective at treating fungal infections of the skin. Few things feel better than a dollop of horseradish when you have a cold. Out in the garden, the only edible I harvest in winter is horseradish. After the ground has frozen and thawed, but before it can freeze again, I dig up two or three crowns and harvest a big handful of roots for cooking. After a light scrub under cool running water, I pat them dry and store them in a plastic bag in the refrigerator. They will keep in perfect condition for months. Or, just dig roots as you need them in cool weather. One commenter shared this horseradish harvesting wisdom: “My dad told me you can harvest horseradish in any month with an 'R' in it, basically September to April. Easy to remember." A common question in the comments thread has to do with how much horseradish to harvest when you dig up a plant. The answer is “all you can find,” because in addition to root buds left behind in the soil, you can replant the growing tips, or share them with fellow gardeners who have asked for a start of horseradish. If you look carefully at the cleaned horseradish root in the picture above, you will see many small light-colored knobs and bumps. These are latent root buds, which is what gives horseradish its staying power. Because horseradish is a very persistent plant, it is best to be careful of where it is planted. But it is not truly an invasive plant, because it does not go willy-nilly with uncontrolled seeds. Mowing or cultivating around a mound of horseradish will keep it in place forever. I keep two plantings, and dig them in alternate years. Horseradish flowers are edible too! Horseradish flowers are unpredictable. 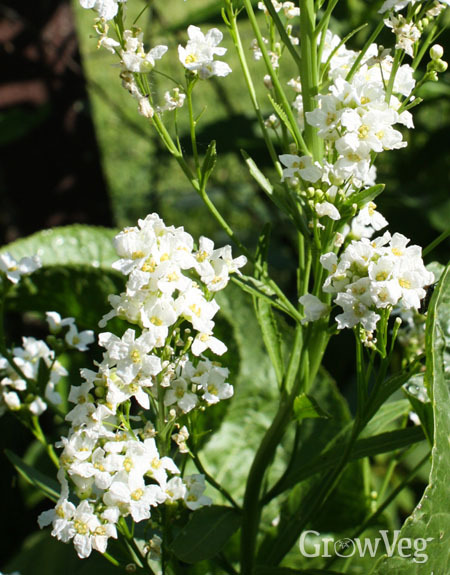 Some horseradish plants never bloom at all, while others regularly produce stalks laden with lacy white flowers. It’s been a pleasant surprise to learn that horseradish flowers are edible, with the flavor pop of horseradish in a mild, faintly floral package. They are wonderfully delicious with grilled fish. Many gardeners have had success growing horseradish in containers, often starting with a root purchased for cooking. Large containers such as half-barrels are ideal, or you can use black plastic nursery pots. Several commenters noted that they can grow potted horseradish in places where other plants are devoured by deer. Authentic wasabi paste, the crazy hot green condiment served with sushi and other Japanese dishes, is made from the roots of a horseradish cousin, Wasabi japonica. But most wasabi products sold in stores are made from good old horseradish with mustard powder and green food coloring added. This substitution is so widespread that outside Japan, few people have ever tasted real wasabi. This means you should feel free to make your own wasabi-like condiments from fresh horseradish, and maybe even start making your own sushi, which is super easy. 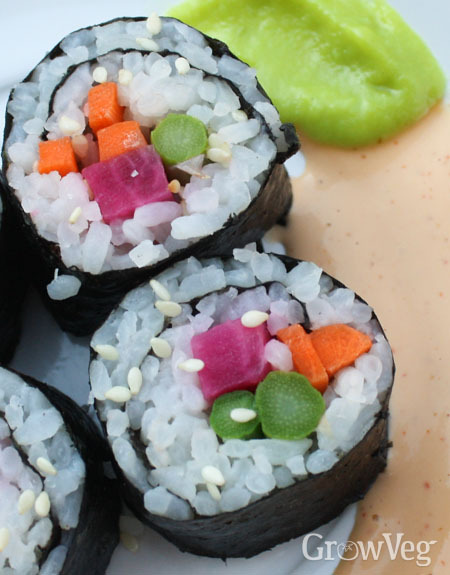 In the veggie version shown here, watermelon radishes pass for raw fish, and the two condiments are made with horseradish. Horseradish mayo is deservedly popular, and making it is a simple matter of stirring some finely grated horseradish into your favorite mayonnaise. But many horseradish fans like sauces that use sour cream, including this recipe shared by commenter Cita: 1 finger-size horseradish root, peeled and chopped, 4 Tablespoons white vinegar, 2 Tablespoons lemon juice, 1 teaspoon salt, 2 Tablespoons sour cream. Set the blender on chop at first, then puree. Finally, several commenters suggested moving beyond condiments, and eating cooked horseradish like a vegetable. When cooked, horseradish takes on an almost potato-like consistency, and the flavor turns from hot to sweet. “Try cutting the root in bite-size rounds, and roast them with other winter root vegetables in olive oil. They retain a little of the pungency and get sort of sweetish.” Marty advised. Brilliant idea!